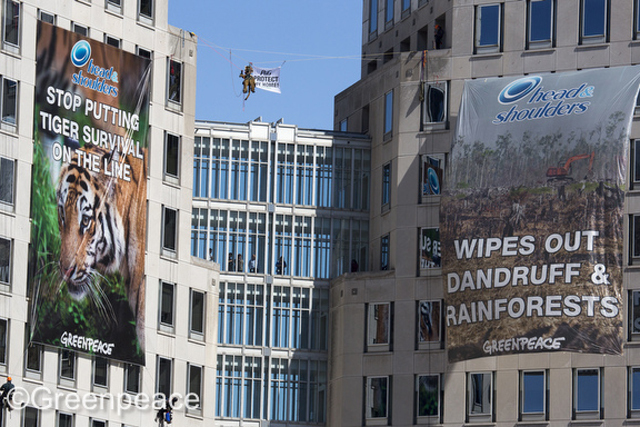 Greenpeace has parodied Procter & Gamble's 'Thank You Mom' ad campaign and festooned the FMCG giant's global headquarters in Cincinnati with massive posters accusing P&G's supply chain of deforestation and the death of wildlife. The ads riff off the P&G campaign’s reference to mothers, by stressing that many orang-utans are being orphaned because their habitats are being destroyed. "Head & Shoulders," reads one banner, "wipes out dandruff & rainforests". Greenpeace launched the mock ads yesterday, following the release 10 days ago of a year-long investigation into P&G’s supply chains. The environmental pressure group has also launched a two-minute video that tells viewers: "If you have P&G products at home, many of which contain palm oil, there’s another story you should see." It lists a number of P&G brands, including Head & Shoulders, Pantene, Gillette, Ariel and Oral B. The film highlights the destruction of forests and the plight of orang-utans, many of which are orphaned because forests are being cut down for palm oil production. It says: "Destroying forest for palm oil plantations means some of us no longer have moms", with images of dead orang-utans. A spokesman for Greenpeace told Marketing that P&G has responded saying it would investigate its suppliers, that it took its sustainability responsibilities seriously and that it planned to be fully sustainable by 2015. However, he added, P&G’s idea of fully sustainable and its own did not tally. Areeba Hamid, one of Greenpeace’s lead campaigners, said: "Greenpeace has confronted P&G for the last eight months with how it is exposing consumers to forest destruction. "Rather than making real guarantees that its products don’t destroy forests, it continues to greenwash its dirty supply chain by relying so-called sustainability schemes that are widely regarded to be weak and ineffective." Greenpeace has also launched a "story-telling petition site" as part of the campaign, targeting Head & Shoulders, which it said has already gained 200,000 signatures. Greenpeace said that P&G is sourcing palm oil from companies connected to orang-utan habitat clearance in Indonesia. Its investigations also found that its sourcing policies are "pushing the Sumatran tiger to the edge of extinction". Hamid added: "The fact is, P&G's supply chains are tainted with forest destruction, and these suppliers are part of the so-called sustainability organisation P&G relies on. It’s time P&G commits 100% to forest protection and stop making its customers a part of habitat destruction." In a statement, P&G said: "P&G is committed to the sustainable sourcing of palm oil. We are members of the Roundtable on Sustainable Palm Oil (RSPO), we support the RSPO criteria established for sustainable palm oil and we are part of the working group on sustainable sourcing of palm oil derivatives. "We have made a public commitment that, by 2015, 100% of all palm oil purchases we make will be sustainably sourced and we are working with our suppliers to ensure we deliver on this commitment. "We are strongly opposed to irresponsible deforestation practices and take any allegation of impropriety by our suppliers very seriously. We will investigate any allegations made to ensure that our policy on the responsible and sustainable sourcing of palm oil has been, and will continue to be, adhered to."